The step-by-step guide to brewing perfect French press coffee #infographic ~ Visualistan '+g+"
Considering the convenience of single pod and drip coffee makers, manual coffee preparation may sound like a foreign—or maybe even unnecessary—concept. But French press coffee may change your mind. With a little patience, some know how, and 5 minutes, you can make yourself a rich, smooth cup of coffee that’s full of flavor and devoid of the sometimes burnt, chalky, bitter taste characteristic of many big-batch coffee brewers. Once you get the hang of how to make coffee in a French press, you can even use it to foam milk. 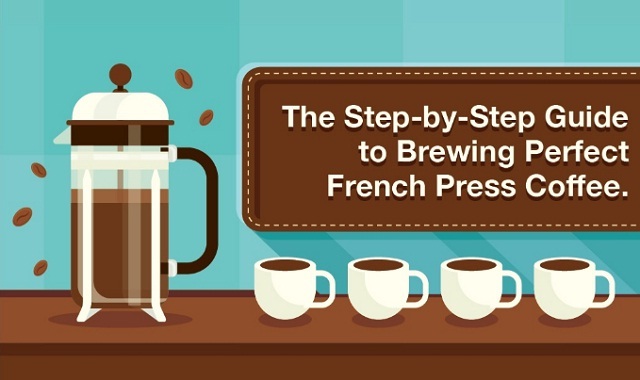 Check out our infographic below to learn more about French press brewing plus how to clean and maintain your press.